Welcome to The Morro Shores Inn & Suites brand new website where you will find our lowest rates and latest availability. Book Direct & Save! Welcome to Morro Shores Inn & Suites in tranquil Morro Bay, California. Located off Highway 1, we are a block away from the Pacific Ocean and just a 5-minute drive to downtown. Downtown Morro Bay has a variety of shops and restaurants including the Galley Seafood Grill & Bar and House of Ju Ju. Morro Bay Golf Course is just 3 miles away. 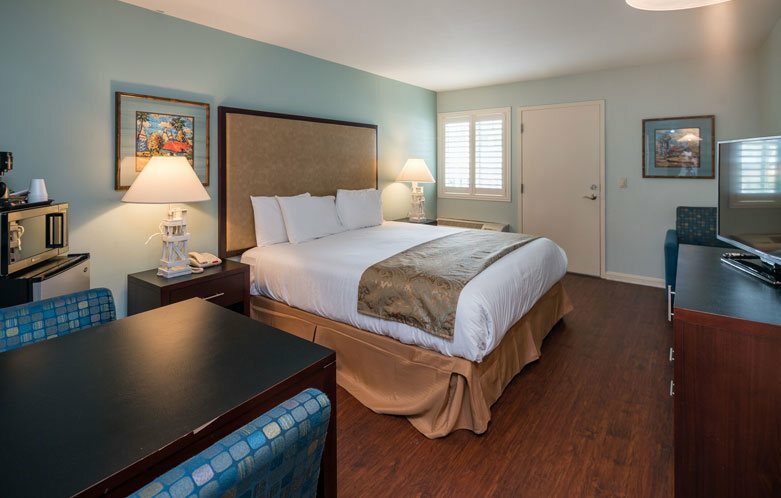 Recently renovated, The Morro Shores Inn has a brand new craftsman style exterior with a warm, inviting coastal decor interior and modern, stylish amenities and furnishings. Enjoy the beautiful courtyard with a four tier water fountain and sitting area allowing guests to mingle or just enjoy the outdoors. 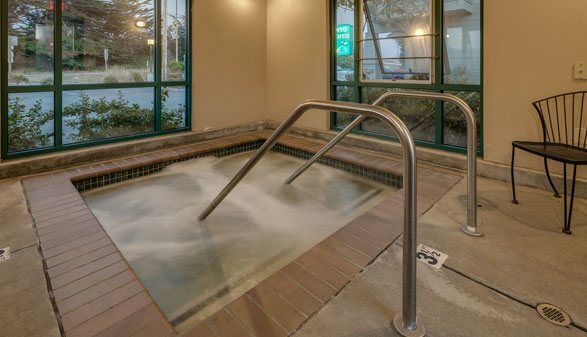 The Morro Shores Inn & Suites offers guests with an astounding selection of guest rooms and suites featuring several amenities that are sure to meet your needs. Here at our Morro Bay hotel, you will enjoy a collection of comfortable, designer decorated deluxe rooms or luxury suites, all with free Wi-Fi and 40” LED HDTVs, pillow top mattresses, and balconies. Deluxe rooms feature one king standard bed, two double beds, or one queen bed. Luxury suites offer a living space/bedroom with a queen size pull out sofa bed, a sofa chair with an ottoman connecting to a bedroom with one king standard bed. Suites also feature a fireplace, 42” whirlpool tub and a patio with a partial park view. All of our guestrooms are ADA Defined service-animal friendly. All guest rooms are equipped with irons and ironing boards, minibars with refrigerators and microwaves, coffee makers, and hair dryers. Many rooms feature small balconies with views of Morro Bay. Unwind in our unique indoor spa room after a long drive or walk on the beach. Our beautifully landscaped courtyard is the perfect place to read a book, mingle or simply kick back and relax. A laundry facility is available onsite for your convenience. Morro Shores Inn & Suites also offers a meeting room that can accommodate over 30 people, making it a great place for a family for friends gathering. Our property is next to Leila Kaiser Park, which has barbecue facilities and a sports field for all your outdoor events and games. Some of our rooms feature views of the park and Morro Rock. Morro Bay offers a selection of activities that include fishing, sailing, kayaking, bird watching, surfing, walking or running on the beach, golfing, and wine tasting. Guests can catch a consistent glimpse of boats sailing in the sparkling waters of the Harbor, while in the distance you can hear calls of the sea birds and the feel of the hypnotic breeze of the ocean. The world famous Hearst Castle located in San Simeon is minutes away. As you drive into San Simeon, be sure to stop and view the elephant seals at Piedras Blancas. Viewing areas are open every day and no fees or reservations are required. Whether going north or south, wine tasting in Paso Robles or San Luis Obispo wineries is along the way. Just south of Morro Bay is Montana De Oro State Park - a beautiful scenic area with lots of hiking trails for the outdoors lover! Waterfront shops and restaurants on Morro Bay Embarcadero are full of everything from clothing boutiques to used bookstores to gourmet coffee shops. With close proximity to downtown San Luis Obispo, you can enjoy the numerous art galleries, fashion boutiques, and restaurants. Unwind in our unique indoor spa room after a long drive or a walk on the beach. Our beautifully landscaped courtyard is the perfect place to read a book, mingle or simply kick back and relax while enjoying the sounds of our water fountain. For your convenience a coin operated laundry is also available in the vending room. Relax in our beautiful coastal themed rooms, enjoying the views from your balcony! You can choose from four different types of suites, or 25 deluxe rooms! All of our rooms include a 40" flat screen LED TV, microwave, refrigerator, coffee maker, iron, ironing board, and hairdryer. The suites also have separate televisions. Two Room Luxury Suite comes with a living room/bedroom with 1 queen size pull out sofa, a sofa chair with an ottoman connecting to a bedroom with 1 King size bed with a fireplace, a sofa chair with ottoman and 42" whirlpool tub, and a patio with partial park view. The Deluxe Rooms come with either 2 Double Beds or 1 Queen Bed ADA, 1 King Bed with a sofa chair and ottoman or 1 King Bed with a sofa sleeper. While in Morro Bay, select from a number of activities including fishing, sailing, kayaking, birdwatching, surfing, walking or running on the beach, golfing, and wine tasting. Morro Bay offers guests a constant view of boats dancing in sparkling waters of the Harbor, while in the distance you could hear calls of the sea birds, and the feel of the hypnotic breeze of the ocean.